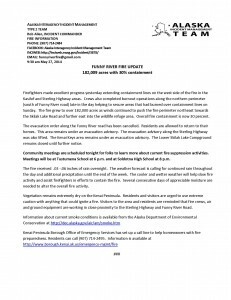 Firefighters made excellent progress yesterday extending containment lines on the west side of the fire in the Kasilof and Sterling Highway areas. Crews also completed burnout operations along the northern perimeter (south of Funny River road) late in the day helping to secure areas that had burned over containment lines on Sunday. The fire grew to over 182,000 acres as winds continued to push the fire perimeter northeast towards the Skilak Lake Road and further east into the wildlife refuge area. Overall fire containment is now 30 percent. The evacuation order along the Funny River road has been cancelled. Residents are allowed to return to their homes. This area remains under an evacuation advisory. The evacuation advisory along the Sterling Highway was also lifted. 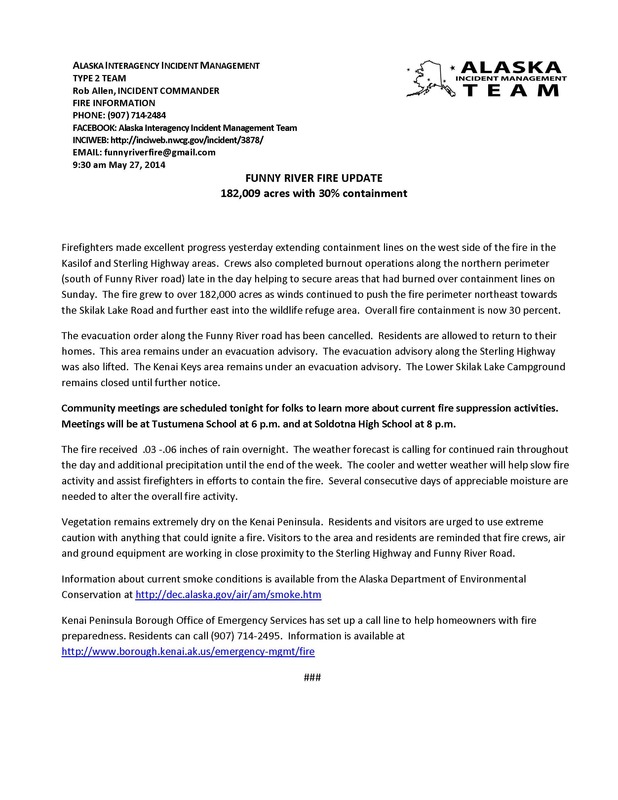 The Kenai Keys area remains under an evacuation advisory. The Lower Skilak Lake Campground remains closed until further notice. Community meetings are scheduled tonight for folks to learn more about current fire suppression activities. Meetings will be at Tustumena School at 6 p.m. and at Soldotna High School at 8 p.m. The fire received .03 -.06 inches of rain overnight. The weather forecast is calling for continued rain throughout the day and additional precipitation until the end of the week. The cooler and wetter weather will help slow fire activity and assist firefighters in efforts to contain the fire. Several consecutive days of appreciable moisture are needed to alter the overall fire activity. 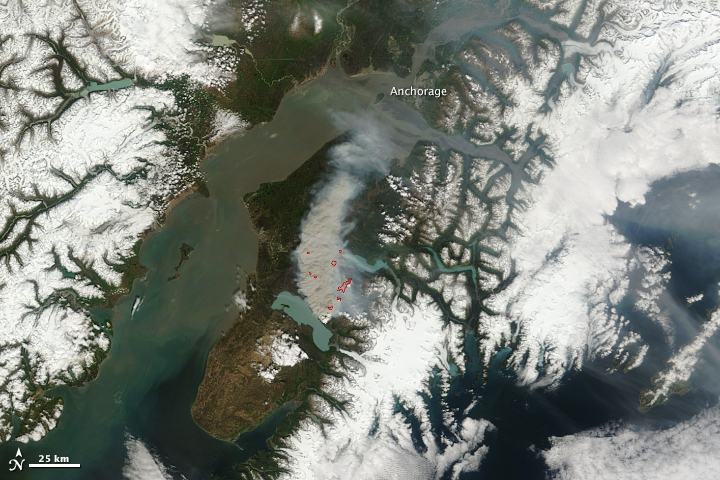 Vegetation remains extremely dry on the Kenai Peninsula. Residents and visitors are urged to use extreme caution with anything that could ignite a fire. Visitors to the area and residents are reminded that fire crews, air and ground equipment are working in close proximity to the Sterling Highway and Funny River Road. This entry was posted on May 27, 2014 at 11:01 am. You can follow any responses to this entry through the RSS 2.0 feed. You can skip to the end and leave a response. Pinging is currently not allowed.